Here is a recipe that you can either use for madeleines or muffins. Or both. I really love the mixture of walnuts and roquefort cheese. The madeleine is soft and the walnuts are crunchy, it is amazing! You have to let the mixture rest for an hour before putting in the oven, that way, the perfume will be stronger. Chop the walnuts, cut the roquefort in dices. Put aside. Beat the egg with the parmesan. Add the flour, then the walnuts and the roquefort, the oil and some pepper. Stir well, add some milk so that it has a creamy aspect (but don't make it too liquid). Let for one hour in the fridge. Preheat the oven at 270°. Put mixture up to 2/3 of the moulds. Bake for 5 min, lower the temperature at 210° and bake for another 6-8 min (it must get brown, but not burn). 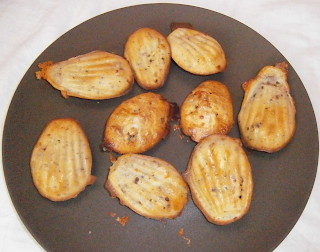 Take the madeleines out of the oven. If you have made muffins, they must bake for another 5-8 min (check the baking...). Wait a few minutes before unmolding.